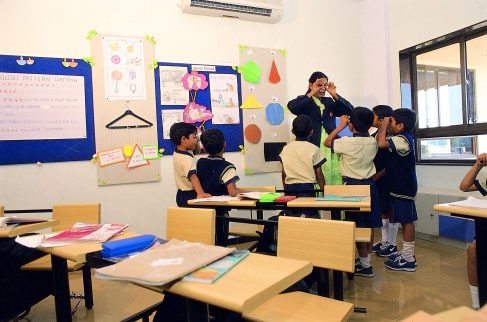 The schools follow the CBSE syllabus integrated with the International Baccalaureate IB PYP Primary Years Programme from Kindergarten to Grade V. The uniqueness of the school largely lies in this blended approach of offering Indian content using International Methodologies. The school follows the international convention of a 12:1 student teacher ratio to optimize learning. Regular field trips are organized based on the PYP programme to help children understand the unit of inquiry in progress. Throughout the learning process, both students & teachers actively get involved in assessing student progress. Students regularly assess their own work & reflect on their learning process. Teachers support the students in assessing their work by providing assessment criteria. Students go-through the pre-assessment, formative assessment summative assessment in PYP. Parent teacher meetings are held regularly in which the teachers describe how the students perform and behave in the class & parents provide their perspective. Students maintain their purposeful collection in portfolio. This helps the students in becoming self-assessors. The portfolio is shared by the students with the parent in a Student-Led Conference. This conference allows the students to play an active role in reporting the progress to their parents. The students also put - up an Exhibition in which they showcase their unit of Inquiry which focuses on the global issues. The subjects are not compartmentalized and the curriculum offers a seamless integration of classroom activities with other essential skills necessary for students to emerge as leaders in the real world. Equal importance is given to developing the cognitive and psychomotor skills of students. The teaching methodology often moves away from books to include the world outside the campus. Instead of being merely providing information in the classroom, they are allowed to explore their various intellectual facilities by seeing and doing things themselves.